Fresh pineapple and ripe mango are finely diced and mixed with little bit of onion and green bell pepper. The mixture can be refrigerated for couple of days. Serve pineapple mango salsa with chips of your choice. 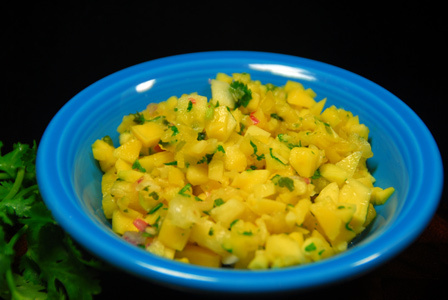 Makes: around 1 Cup of Pineapple Mango Salsa. Peel and finely chop the slightly ripe mango. Remove skin and finely chop the pinapple. Wash, halve, discard seeds and finely chop the bell pepper. In a mixing bowl, mix together chopped pineapple, mango, bell pepper, onion, cilantro and salt. Serve pineapple mango salsa with chips of your choice. Notes: Make sure to chop the ingredients in same size. Suggestions: Add few pinches of sugar if mango or pineapple isn’t sweet enough. Variations: Check other salsa recipes here. Other Names: Pineapple Mango Salsa. Thin rice flakes / poha is toasted on low flame till they are crisp. Whole spices briefly fried in oil along with garlic and crushed with help of a pestle. The crushed spice mixture is then mixed with toasted rice poha for flavor and spice. 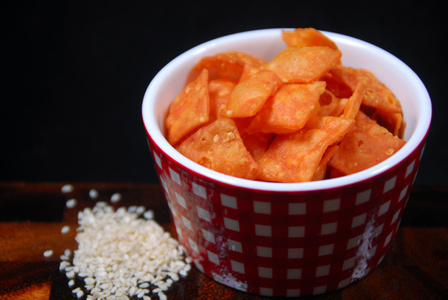 Serve crispy masala rice flakes as a tea time snack. 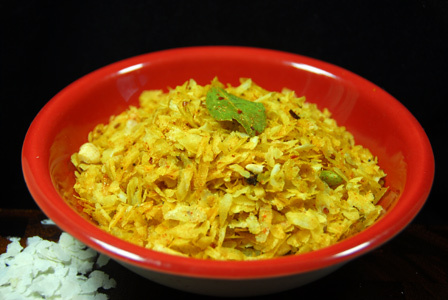 Makes: around 2 Cups of Crispy Masala Rice Flakes. Break raw cashews into small bits and keep aside. Heat a wide pan on medium – low heat, add thin rice poha and roast until crisp. (around 3 minutes). In a big mixing bowl, add roasted rice poha and broken cashews. When mustard seeds almost stop spluttering, add sliced garlic. Fry breifly, remove the pan from heat, add red pepper flakes, red chile powder, coriander powder and turmeric powder to the pan. Immediately pour the spices onto poha/ rice flakes bowl. Add salt and mix everything carefully and store tight in a clean dry jar and it stores fresh for a month or two. 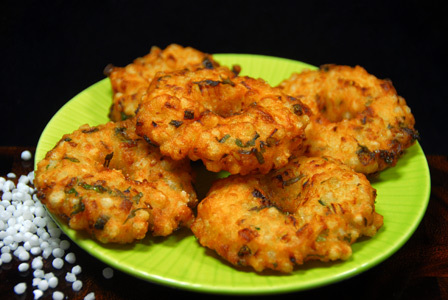 Serve crispy masala rice flakes as a snack. Suggestions: Adjust spice with red chili powder or red chilli flakes. Variations: You can also deep fry the poha in which case, use thick poha. Other Names: Crispy Masala Rice Flakes, Masala Atukulu Mixture. Plain flour / Maida is made into dough with powdered spices and sesame seeds. The dough is rolled out and cut into diamonds. The diamonds are then deep fried in oil till golden brown and crisp. Serve savory diamonds as a snack. Makes: around 4 Cups of Savory Diamonds . Heat oil in a small pot until smoking hot. 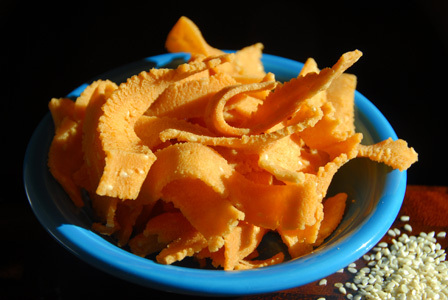 In a mixing bowl, mix plain flour, red chili powder, sesame seeds and salt together. Pour the hot oil onto the above mixture. Carefully fold the mixture and slowly add water and knead into a somewhat tight dough which doens’t stick to fingers. Make the dough into two portions and leave it aside covered for few minutes if required. Roll out each portion into circular thin layer dusting extra flour if required. With a knife make one inch wide vertical cuts on the rolled out circle to make long strips. Make another sweep of cuts with the knife with a slight slant to make 1 -2 inch diamonds. Repeat the same with other portion of the dough. Heat oil in a frying pan, slowly drop the cut diamonds into hot oil. Once the diamonds turn light goldern brown, remove onto absorbent paper. Repeat frying the remaining cut diamonds. Store savory diamonds tight in a jar and they stay fresh for few months. Notes: Don’t over fry the diamonds. Suggestions: Adjust red chili powder according to your preference. Variations: You can also add your choice of powdered spices to the dough if you wish. Other Names: Savory Diamonds, Karam Kajalu, Chakra Banalu.